You can do a number of things with both the skin and the flesh, and seeds of the African Star Apple. At the start of my exploration, I didn’t realise how much of the flavour was in and could be extracted from the flesh. The notes below chart my progress with this fruit that can be drunk hot or cold, used in mocktails and cocktails. All hail the versatility of le fruit. I’ve observed that drinks with the skin and seeds tend to be clear while those involving the flesh end up cloudy. Quite frankly, this drink is difficult to identify as Agbalumo. An infusion of the skin and seeds with saffron, cardamom and sugar it has a nice vibrant colour and a taste that’s sweet and spiced and gentle with bitter flavours. My children drank it for 2 days and then couldn’t stomach any more. One night, I had a cold and decided to make some ‘tea’, using Agbalumo puree, with honey, lemon and water. It was interesting – very sour, like lemons and high in Vitamin C. It didn’t cure me, but it taught me some more about Agbalumo. My next venture also used the skin and seeds, as the flesh went into more ‘serious’ preparations – purees and curds and bakes. I plonked left over skin and seeds into a bottle of Sauvignon Blanc and let it chill in the fridge for a few weeks. When ‘ready’, the taste was reminiscent of bitters and ‘kanda’ – the skin had imparted its tart, bitter taste. Combined with some scent leaf syrup, it was drinkable but we returned to the ideas table. While macerating some fruit – tossing it in sugar, I observed a lot of liquid was drawn out, from the seeds and from the flesh. By this time, I had discarded the skin in the drink preparations. Left overnight, the resulting liquid is the very essence of Agbalumo. Simply combined with water and ice, this made for an intensely rich ‘ade. I tested a version with orange slices and that came through in flavour quite clearly. This was my first real success capturing the unmistakeable, undeniable flavour of Agbalumo in a drink. This time, I added the flesh of 4, 5 agbalumo into a bottle of Sauvignon Blanc and left it for a couple of weeks. Now this was the beauty. The wine was beautifully infused with the Agbalumo. To amplify the taste, I combined it with the base of the Agbalu’lade – the liquid from the maceration. The result was absolutely beautiful – sweet, sour, fruity with’cherry’ flavour, this was a hit. It had the clarity of flavour of Canadian Ice Wine – that cool, crisp, refreshing but sweet flavour. At the base of this was macerated fruit, topped up with a variety of liqueurs. 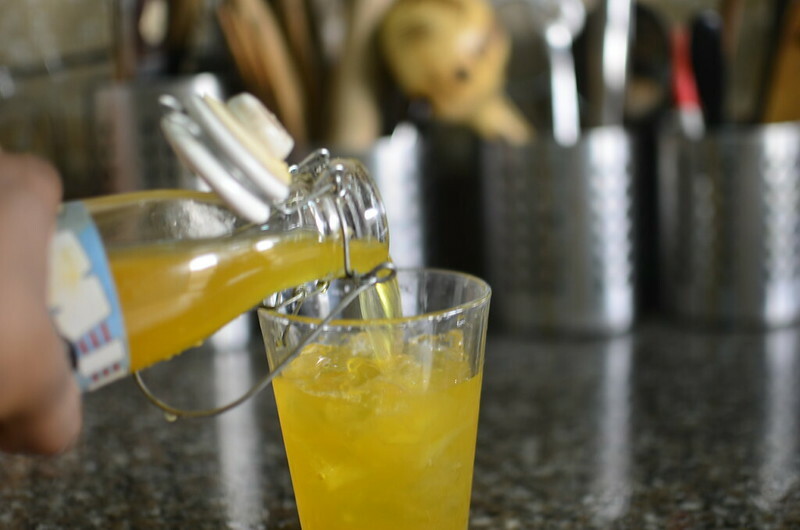 I made two versions – an Agbalumo brandy liqueur using fruit, sugar, brandy and vodka; and an Agbalumo-Orange liqueur with Cointreau. I haven’t tasted them yet but overnight experiments conducted with vodka support their truth of ‘da bomb’. We shall see.